Pick up your credentials for the event. Sign up for an ADEC Membership. Sign up and pay for CE credits. Pay for a T-shirt. Ask a question. Come and meet ADEC’s leaders and Board members and receive helpful information about ADEC membership! Network with other new members and first-time conference attendees. We look forward to seeing you there! Welcome to the 40th Annual ADEC Conference. Help us recognize this year’s award recipients. Everyone is invited to attend the Awards Ceremony, which will take place prior to each day’s keynote address. Timothy J. Copeland, Funeral Director (Speaker) Former Owner, Copeland Funeral Home, Inc. The Labyrinth: Exploring an Ancient Path for New Insights. The loss of a companion pet can be a difficult grief, so come and share it with others who have faced a similar loss. Bring a photo to share and/or a brief story to share with the attendees, if desired. All students and New Professionals are welcome to attend this meeting, meet leaders in the field and establish connections. 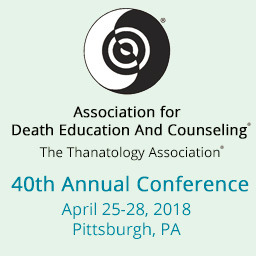 Learn about the process and requirements for earning Certification in Thanatology: Death, Dying and Bereavement and the Fellow in Thanatology: Death, Dying and Bereavement. Teaching Ideas and Methods for Pre-Med and Medical Students. Continuing Bonds: from Revolutionary Roots to Mainstream Model? Dennis Klass, Ph.D. (Speakers) retired, None! Join other attendees in remembering loved ones. Request names to be included in the ADEC memorial book at the registration desk so that their memories will remain a part of the life of ADEC. Don’t miss the ADEC Business Meeting. Student Paper Award winners will be announced, and ADEC leaders will speak about the accomplishments of the past year. Members can learn about the day-to-day work of their association. All are welcome. Grieving for Strangers: Rubbernecking or Experiential Empathy? How Might Differential Susceptibility Influence Complicated Grief? Lynda Shand (Speakers) Associate Professor, The College of New Rochelle School of Nursing and Health Professions.